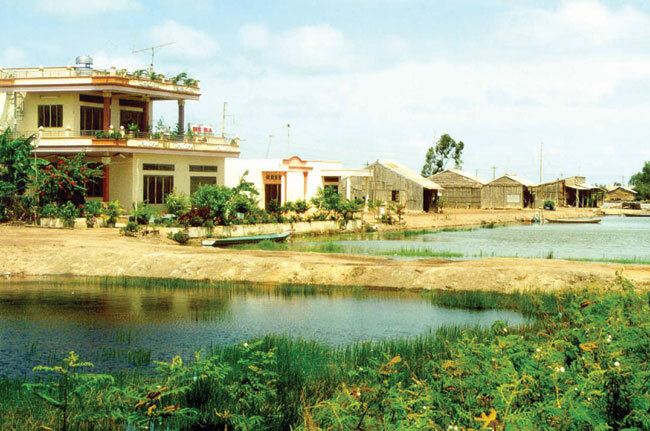 HAU GIANG (VNS)— Prime Minister Nguyen Tan Dung has agreed to a three-year extension of the second phase of a programme to build elevated houses for people in the Cuu Long (Mekong) Delta region affected by floods. Speaking at a conference to review the implementation of the programme in the Mekong Delta province of Hau Giang yesterday, Dung said that although the second phase had finished this year, there were still more than 8,400 households in need of help. Meanwhile, the need for resettling people living in flood and erosion prone areas was still urgent as new erosion spots kept appearing. The Prime Minister urged the Ministry of Construction to work with other ministries and localities to review the programme's beneficiaries while continuing to lend money to poor people facing a crisis. Specifically, Dung agreed to extend the repayment time by three years for more than 25,800 poor and near-poor households. The total amount loaned to date is VND226 billion (US$10.7 million). Dung asked local authorities in the Mekong Delta to see the programme as a key task, saying that it was crucial to listen to local feedback to ensure consensus and mobilise all possible resources. "With a total area of 40,000 square metres and a population of 17 million, the Mekong Delta contributes 16 per cent of the country's gross domestic product, grows 90 per cent of the total rice crop and raises 60 per cent of farmed fish and prawns for export," Dung said. However, the Government leader pointed out that the region still faced difficulties due to severe destruction during the war, poor infrastructure and low levels of education, training and healthcare. "The region is also prone to devastating natural disasters, especially floods," he said, adding that the Mekong Delta was expected to be one of the areas hardest-hit by climate change. He said that the extension of the flood-prone housing programme until 2020 aimed at finishing all work and reviewing new issues, including creating flood-prone clusters and dyke systems. Launched in 2011, the flood-proof residential areas building programme has produced a number of results. In the first phase from 2011-2008, as many as 804 smaller programmes to construct flood-resilient areas and dyke systems were implemented with an investment of VND5.77 trillion (US$288 million), protecting 146,000 households in flood-prone areas of eight regional localities. During the second phase scheduled to finish this year, the programme aims to provide flood-proof houses for 56,000 more local households. So far, as much as 97 per cent of the workload has been completed with as many as 27,185 of the planned 35,595 houses constructed. By the end of 2014, total capital disbursement under the programme amounted to nearly VND2.86 trillion ($132.3 million) sourced from the central budget, the Bank for the Development of Viet Nam and the Viet Nam Bank for Social Policies. Minister of Construction Trinh Dinh Dung noted that thanks to the programme, human and material damage by storms and floods in the region was 15 per cent less than the previous year. The programme ensured safety for more than 200,000 households or more than one million people, most of whom were impoverished, he noted.